The village of Hathersage, situated below the four-mile long gritstone escarpment of Stanage Edge, is forever associated with the legendary medieval outlaw Robin Hood’s faithful lieutenant, Little John, who was allegedly born and was buried in the village. You can still see his grave, now maintained by the Ancient Order of Foresters, between two clipped yews just outside the church door in the village churchyard. Once the centre of a thriving needle and pin making industry, Hathersage is more peaceful now, its serenity only interrupted by the bustle of traffic on the A625 between Sheffield and Castleton. The village was also formerly an important centre for mill and grindstone making, and the unfinished and abandoned remains of these massive stones are still to be found scattered at the foot of the edges. Hathersage is on the A625 Sheffield-Castleton road at the eastern entrance to the Hope Valley, about eight miles (13 km) north of Bakewell. 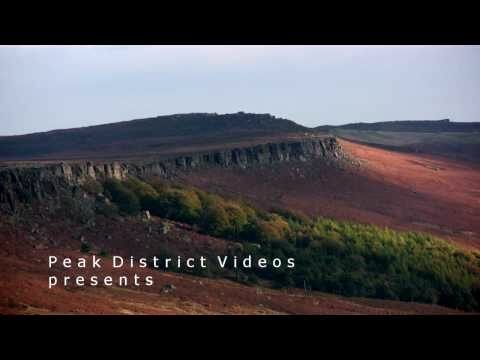 Hathersage takes its name from the Old English for “Haefer’s ridge” – a reference to the moorland expanses above and below Stanage Edge which frowns down on the village to the north. Extensive remains of Bronze Age occupation have been discovered on Hathersage Moor, showing that this now bleak moorland was quite heavily populated up to 4,000 years ago, when the soils were richer and the climate kinder. These remains include clearance cairns, field systems and stone circles, and the mysterious fort of Carl Wark, below Higger Tor. Once thought to date to the Iron Age, Carl Wark is now thought by archaeologists to be considerably older, perhaps dating to the Neolithic period. The massive defensive wall on its western approach is still very impressive. The manor house at Upper Padley, in the woods on the north bank of the Derwent near Grindleford, was originally built in the late 13th and early 14th centuries by the De Bernacs, who came from Normandy with William the Conqueror. The manor eventually passed to the Roman Catholic Fitzherbert family by marriage in the 16th century and became a missionary haven for Catholic priests for almost 30 years. On July 12, 1588, Padley Manor House was raided by the Protestant Earl of Shrewsbury, and two priests were found. Nicholas Garlick and Robert Ludlam were arrested and taken to Derby Gaol, where they were charged as having come into England as Catholic priests. They were both convicted, sentenced to death and hung, drawn and quartered on St. Mary’s Bridge, Derby on July 24. The remaining gatehouse of the manor, now converted to a chapel, has become a place of pilgrimage for Catholic visitors (see Places to Go). Sheltering below Stanage Edge stands the battlemented Tudor tower house of North Lees Hall (now private, self-catering accommodation), the home of the Eyre family for many generations, and said to have been the model for Mr Rochester’s Thornfield Hall in Charlotte Brontë’s smouldering Victorian classic, Jane Eyre. There could well be an element of truth in the story, because it is documented that Charlotte stayed with her close friend, Ellen Nussey, at the vicarage in Hathersage while she was writing the book. The town of “Morton” in Jane Eyre is thought to have been based on Hathersage. North Lees Hall is just one of seven Eyre halls around Hathersage, all thought to have been built during the 15th century on his 20,000-acre estate by Robert Eyre for his sons, and all within sight of one another so he could keep an eye on them. Another is the paradoxically-named Highlow Hall, on the opposite bank of the Derwent, which is said to be the most haunted house in the Peak District. Among the ghosts is the White Lady, apparently the jilted sister-in-law of one of the Eyre boys. The church of St Michael & all Angels stands on a grassy knoll above the village. The church's main attraction is undoubtedly the grave of Little John, Robin Hood's trusty sidekick. The award-winning Round Building cutlery factory on the Bakewell road just outside Hathersage is a good example of a former industrial site being sensitively redeveloped. It was designed by Sir Michael Hopkins in using the foundations of the village’s former circular gas holder. David Mellor was recognised as one of the best-known British designers of the 20th century, responsible for a range of tastefully-designed cutlery, the modern traffic light, the square pillar box and a range of different street furniture. You can see cutlery being made in the factory, and enjoy your lunch or coffee in the award-winning café and shop (01433 650220) under the constantly changing lights of a traffic light. In summer when the weather is fine, the Open Air Swimming Pool in Hathersage (01433 650843) is worth a visit. There are not too many swimming pools in the National Park, and even fewer open air ones, but the full-length pool in Hathersage is very popular es[ecially with children when open during the summer season. Longshaw Lodge (NT) was built as a shooting lodge for the Duke of Rutland in 1830 and was acquired by the forerunner of the Sheffield branch of the Council for the Protection of Rural England in 1927 and passed to the National Trust in 1931. Today it is run as a country park where the newest facility in the grounds is a Moorland Discovery Centre for educational groups. There is also a café and shop in the Lodge itself. Longshaw is also the home of one of the oldest sheepdog trials in the country, which take place in front of the lodge every September (see events). Padley Chapel near Grindleford, is a place of pilgrimage for Catholic visitors. This is where on July 12, 1588, Nicholas Garlick and Robert Ludlam, two Roman Catholic priests, were arrested and taken to Derby where they were hung, drawn and quartered in Derby a few days later. The gatehouse of the manor, now converted to a chapel, is open to the public. The Hope Valley Country Market takes place in the Methodist Church Hall, Main Road, Hathersage on Fridays except those from mid-December to the end of January. There are many pleasant riverside walks through the woods from Hathersage, or through the National Trust’s Longshaw Estate, one of the trust’s first landscape acquisitions in the Peak, from Longshaw Lodge above the village. The promenade along the four-mile extent of Stanage Edge is another worthwhile walk from the village, and there are extensive views up the Hope Valley towards Win Hill and Lose Hill on the Great Ridge above Castleton, with the brooding presence of the Kinder Scout plateau in the background. Nearer at hand, you can watch the human-fly antics of the rock climbers on the vertical faces of the edge. The gritstone escarpment of Stanage Edge, above Hathersage, is a Mecca for rock climbers, and many have gone on to conquer Himalayan giants after they having cut their climbing teeth here. There are over 850 climbing routes of varying difficulty on Stanage Edge, including ones with such challenging names as the Left and Right Unconquerable Cracks – both of which were actually conquered by 1949. Climbing can be a dangerous sport, so you should start by joining a recognised club. For more information contact the British Mountaineering Council in Manchester on 0161 445 6111, or visit www.thebmc.co.uk. The Hope Valley Line runs from Sheffield to Manchester through some of the Peak District's finest scenery. With a stop at Hathersage it is easy to take the short trip to Edale (15 mins) and spend a day on the hills around Kinder or Mam Tor. Another great evening's entertainment if you're into folk music and beer is the Edale Folk Train (fourth Tuesday in the month) which can again be picked up at Hathersage. The prominent former coaching inn on the main street, the George Hotel, has a fine reputation for good food with the emphasis on locally-souced fresh ingredients. Taking its name from the village’s most famous son, the Little John Inn in Station Road, Hathersage, serves a variety of locally-brewed, traditional beers, including its very own Little John Ale. The Scotsman’s Pack Inn, overlooking a trout stream in School Lane, was named after the packhorse men who plied their trade across the neighbouring moors. The Millstone Inn, on the Sheffield Road, once served the workers in the nearby millstone quarries, but it is now a favourite haunt for climbers and walkers. The Plough Inn at Hathersage is situated on the banks of the River Derwent at Leadmill Bridge, just outside the village. It serves a range of hand-pulled ales, plus both Continental and traditional English food. The Fox House Inn at Longshaw caters for walkers, visitors and business people and serves a good selection of real ales and bar meals. Also at Longshaw, the Grouse Inn serves award-winning real ales, and provides delicious pub meals too. There are two Indian restaurants, established Sangams and, introduced in 2014, Maazi (in the old Walnut Club premises). An excellent local food shop and café is to be found at Coleman’s Deli (wood oven pizzas on Friday evenings) in The Square, Main Road, Hathersage, where there’s a wide range of delicacies to eat in or take away. And you should also try some Hope Valley Ice Cream, produced at Thorpe Farm, Hathersage by the Marsden family, using milk from their own dairy herd. An ice cream parlour is open at the farm every Saturday and Sunday afternoon. Hathersage isn’t short on holiday accommodation providers – see the full list of Hathersage places to stay. Bakewell TIC: The Old Market Hall, Bridge Street, Bakewell, DE45 1DS; Tel: 01629 816558; www.peakdistrict.gov.uk, open daily. Castleton Visitor Centre: Buxton Road, Castleton, Hope Valley S33 8WN, 01629 816558; www.peakdistrict.gov.uk; open daily. Public toilets and car park: Oddfellows Road, Hathersage. Doctors: Evelyn Medical Centre, Marsh Avenue, Hope, S33 6RJ, 01433 621557. There are two cash machines in the village.